Cloud Mist green tea is one of chineses top ten tea. It is also known as Lu Shan Yun Wu Green Tea. 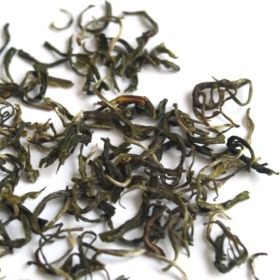 This tea is harvested from the peak of Mount Lu, a beautiful scenic spot shrouded in thick mist. Produced by the most tender tea buds. A very unique and lasting sweet taste with hint of nutty and fruity notes. Soft and smooth in the mouth and brings thin but long aromatic flavor that fills the mouth. Shaped into curly and tiny stripes resemble a little hook. The infusion yields yellow color liquid. This has quickly become one of my favorites. Its one of the most perfect green teas Ive had. Its clean and crisp with a wonderfully refreshing cooling quality that makes it great even on a hot day. The price is a little high, but its worth it! The tea was completely different from the photo. When brewed the tea was very brown and tasted like Shou Mei. The package smelled of insecticide. the tea I received was Yu Wu Bi Luo Chun (?????) tea, not Yun Wu (??) tea. Its certainly a decent tea, but not what I ordered. Great service from TeaCuppa! After accidentally sending me the wrong tea at first, they sent me the right one free of charge. The tea is great.